Last Wednesday night, we gathered here to mark the beginning of our forty day journey known as Lent. If you’ve done the maths, you might have been confused, because it is actually more than forty days from Ash Wednesday to the Feast of the Resurrection. That’s because the Sundays aren’t counted. You get to ease up one day a week. Many people choose to fast during Lent, but Sundays are always feast days in honour of the resurrection, and you can’t feast and fast at the same time, so the Sundays are not counted in the forty days. The reason Lent is forty days is because it is deliberately recalling a number of biblical stories and symbolically placing us into those stories. The two most obvious are the forty years that the Hebrews spent trekking through the wilderness before they entered the promised land, and the story we heard in the gospel reading tonight – Jesus spending forty days in the wilderness before the commencement of his public ministry. We heard Mark’s version of this story tonight. It is very brief. Matthew and Luke give more detailed accounts of the confrontation between Jesus and the satan, with some specific temptations described. Mark simply says that “the Spirit drove Jesus into the desert and he remained there for forty days, and was put to the test by the satan.” End of story. You may have noticed that Jesus’s confrontations with demonic spirits seem to mostly occur in the religious places. Here again we are seeing a link between what the satan is doing and what the religious leaders try to do to Jesus. Both are putting him to the test and trying to derail him, to throw him off track. And so the challenge or the test for Jesus is to stay the course, to hold his line, to refuse to be thrown or lured into embracing some other way than the way of the gospel that he has embarked on. And of course, as we know from Matthew and Luke’s more detailed accounts, and from Mark’s accounts of the testing encounters with the Pharisees, the temptations are always subtle. The satan and his agents do not usually come out and suggest that we should do something obviously evil. Instead they appeal to the ends we are rightly wanting to achieve and suggest a slight variation of the strategy, a subtle exploitation of some alternative means of achieving those ends. After all, the ends justify the means don’t they, they ask, as though it were a Biblical truism. But Jesus resolutely asserts that the opposite is true, that the means is the message, and that once you embrace suspect means, however subtle, the message has been fundamentally changed and you have failed the test. 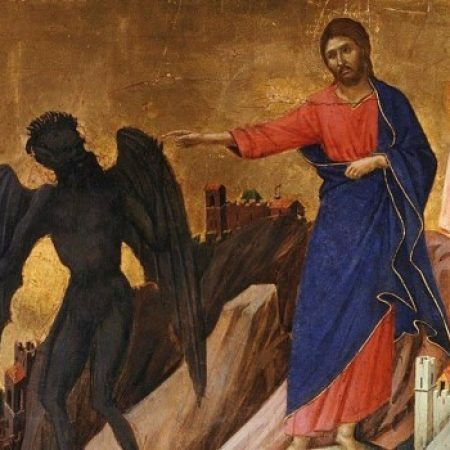 So as this season of Lent seeks to immerse us in this story, the challenge to us is to similarly boldly face up to our demons, to our weaknesses, to our temptations, and to face them down, to hold the line with Jesus and refuse to compromise on the means with any lame justification about the purity of the ends. This is a time for us to take stock and identify the things that constantly seek to derail us. It is a time for us to name their power in our lives and, in naming them, take a stand against them and against their influence on our behaviour. For Jesus, as a charismatic natural leader with a huge mission in front of him, the temptations were to exploit his power and gifts to attract attention, eliminate his enemies, and impose his will on the world by force. For us, it might be quite different. Not all of us face the same temptations as charismatic natural leaders. You all know that line in our regular prayers of confession: “when we use our power to dominate, or our weaknesses to manipulate.” There is a whole spectrum of behaviours there, and all of us face temptations somewhere along that line. The challenge is to face them intentionally, so that we might know we are up to the job and be able to face the challenges of the future boldly. Notice it says that it was the Holy Spirit who drove Jesus into the desert to face the forty days of testing. Jesus had to prove to himself that he had what it takes to embark on the journey that lay ahead of him. Similarly, our annual season of Lent invites us to deliberately take stock and see what we are made of. And so the best Lenten disciplines are those personalised ones which you design for yourself, perhaps in consultation with a wise mentor, and which deliberately challenge you at the points where you are most vulnerable to falling into self-delusions and destructive patterns and compromises with the powers of deathliness and lovelessness and hostility and fear and despair. Challenge those things that would keep you from being all you were created to be, so that you might drive them back and emerge from the wilderness, probably not altogether free of them, but knowing that you have got what it takes to hold the line whenever they launch another attack. In the story, we see Jesus emerge after his forty days in the desert and begin travelling around Galilee preaching the good news that the kingdom of God had come within reach and that it was time for everyone to respond by turning their lives around and getting on board. The time is fulfilled, he said. There is no more reason to delay. We have spent our time in the wilderness and faced our demons. We have tasted the ministering care of God’s angels and we have seen the promised land that flows with the milk and honey of God’s gracious forgiveness, love and generous acceptance. The time is now. The kingdom is at hand. Get on board. Calling it a kingdom, of course, implies the presence of a king who reigns. Which is why it is so potentially threatening to the various other nations and families and organisations and tribal groupings that want to claim our allegiance and tell us how we should behave. The kingdom that Jesus proclaims is one where Jesus claims priority over all those other claims, and calls us to imitate him and live out his life no matter what alternatives we might be tempted with and even ordered to accept. As I said a few weeks ago, I often find it helpful to think of the kingdom not so much as a place, but as a culture. Just as some people try to maintain the culture of another country while living in a new country, so we are called to live as aliens, holding firmly to the culture of Jesus, regardless of what the other surrounding cultures might be trying to get us to conform to. When our society or our political leaders ask us to accept the ways of vengefulness and self-aggrandisement, we are called to be people of graciousness and humility. When all around us become fearful and defensive and unwelcoming, we are called to be loving and open and welcoming and inclusive. When all around us invoke an image of an angry demanding and vengeful God to justify their campaigns against those who are perceived as a threat to our lifestyle or our values or our security or our righteousness, we are called to be a people who bear witness to the unfailing love and mercy and self-giving of God, and who bear that witness by living it out ourselves in lives of freedom and mercy and love. For this is the gospel, the good news that has drawn near in Jesus. God is not some two-faced monster, now loving, now vengeful. Even when the floods of destruction threaten to engulf the world, God provides a way of escape and invites all to get aboard. No one is left behind unless they defiantly refuse to get aboard. This Lenten season is all about getting on board. That is why it is so strongly linked with the catechumenate, the school of discipleship by which the Church seeks to teach newcomers what it means to get on board with Jesus. Those of you who were here on Wednesday night witnessed that connection with the culmination of the catechumenate. Jesus had had years of growth and formation before that final intense forty days that launched his ministry. This past week, in churches throughout the world, many catechumens have been enrolled as candidates for baptism at the coming Paschal Vigil. One of those catechumens is making the journey here among us, and on Wednesday night, Acacia asked us if, when this final forty days of preparation is over, we would baptise her into the membership of Christ’s Church here. Having watched her grow up and grow into such committed participation in our common life of faith, we had no hesitation in saying “yes”. And so now for her, this forty days is, as it was for Jesus, a final time of preparation, of self-examination, before committing herself for life to her God-given role as one of Christ’s ambassadors in the world. But it is for all of us too. It is for all of us as we share the journey with her, and relive the journey for ourselves with her and with Jesus. John in particular, is joining her in the preparation, because on Wednesday he asked us if after this Lenten season we would accept him into the membership of this congregation by renewal of his baptismal vows. But even the long-term members, the most seasoned campaigners, and the most trusted ambassadors among us need this time regularly to re-examine our own call and to face again our own demons, to ensure that they have not been stealthily regaining the upper hand over us such that we are in renewed danger of being derailed into ways and means that are incompatible with our baptismal vows to live the life of the culture of God. Jesus is here to walk the road with us again, and to give us the courage to face whatever we have to face and to overcome it in his strength, so that we might emerge renewed and inspired and with a steely resolve to walk the road with him all the way to the cross and the deep waters of death and on beyond into the promised land of love and mercy and grace.